In-camera processing both for visualization and intelligence 3rd party software must be purchased for additional intelligent features, which must run on external device. 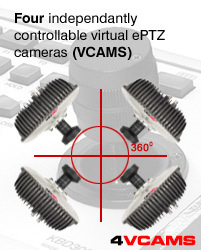 "The Halocam is designed with the CCTV/Security professional in mind"
No lag Substantial image lag due to compression/decompression, switching, etc. "Camera to DVR connection is likely to remain analog for 3-5 years." "In-Camera processing is critical for distributed CCTV in the future"
• encoding, decoding, routing, etc.